When the spaces where you spend your days are well-designed, the impact is more than visual. Here we highlight this year's award-winning spaces from the South Central Chapter of the American Society of Interior Designers. 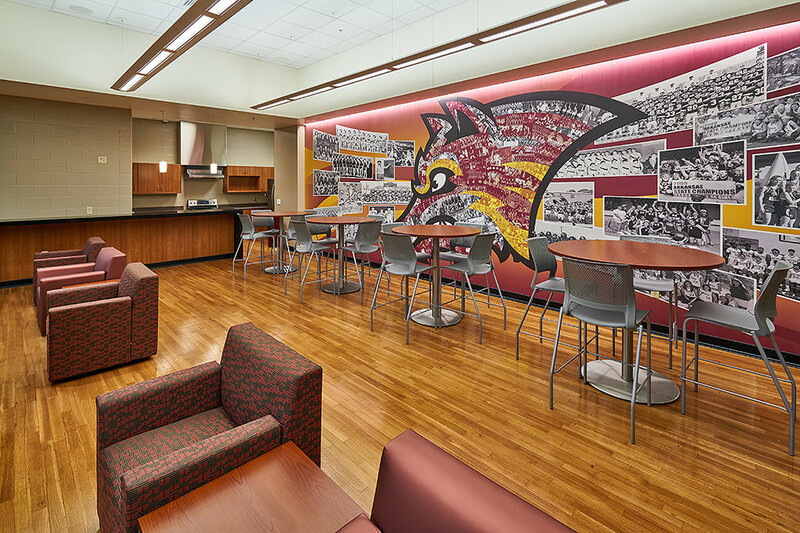 When the spaces where you spend your days are well-designed, the impact is more than visual. 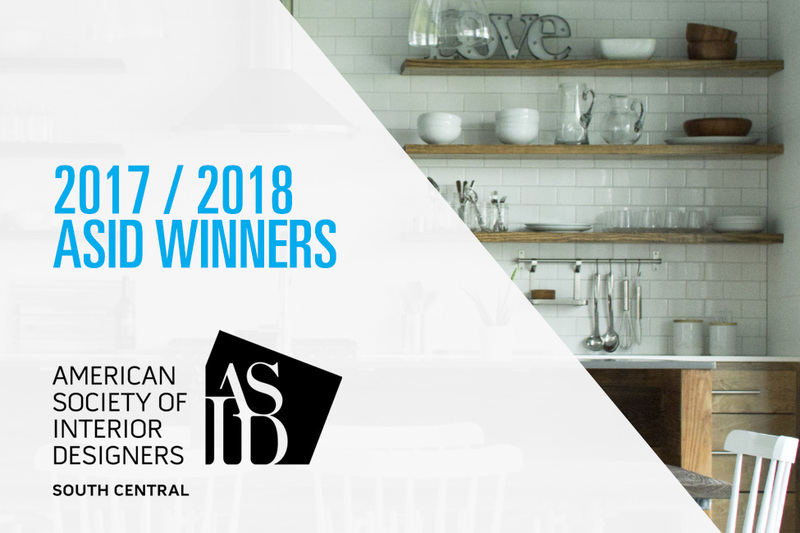 Below, you'll discover works that exemplify that very concept, works that earned their Arkansas creators honors in the 2017/2018 Excellence in Design Awards from the South Central Chapter of the American Society of Interior Designers. Read on to learn more about the concepts, challenges and creativity behind this year's winning designs. 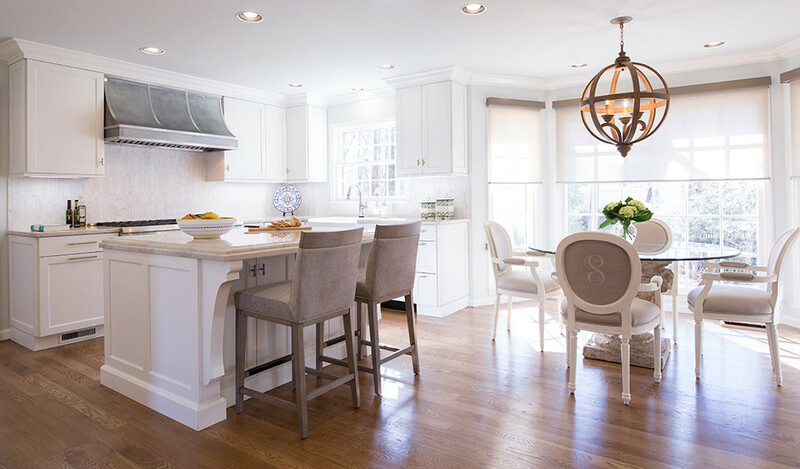 This kitchen renovation began as the design concept for a simple laundry room project that was in its final stages. Even though it was functional, they had always hated the look of the existing kitchen and knew the layout could be improved. As a result of their excitement from a well-planned laundry room, they asked for a new kitchen design. 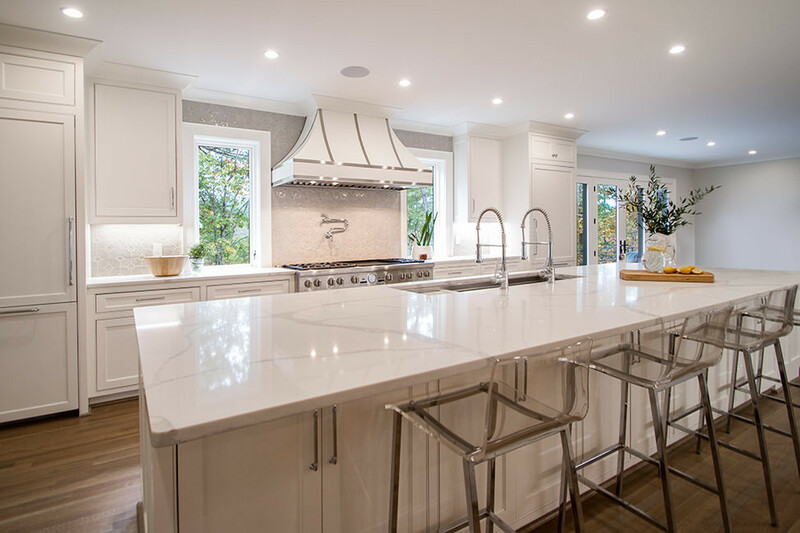 This new kitchen was to have a lighter, more up-to-date feel while continuing the aesthetics of the rest of the home, which they had been gradually updating. 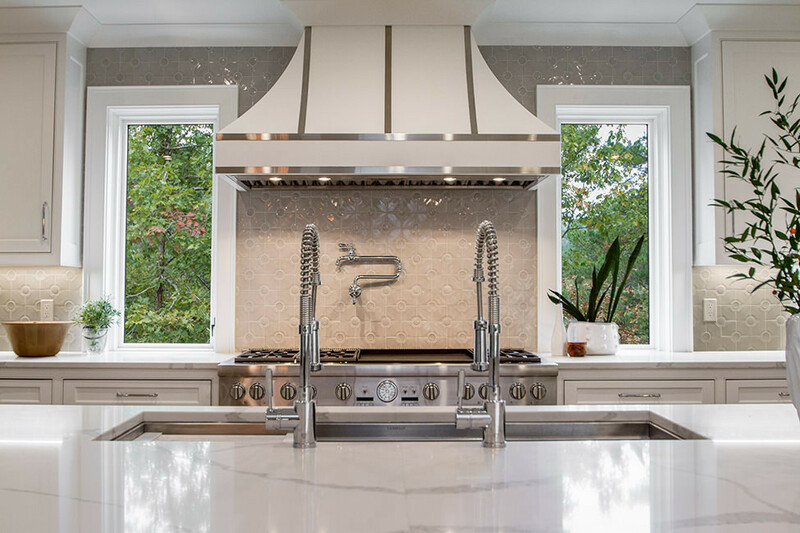 The client loved the white of the painted cabinetry, the grays of the carrera backsplash and the warmth of the quartzite countertops. To make these tones work well together, the designer wished to specify a two-toned hardware. There was not one that combined the two desired finishes — satin brass and stainless — so the designer commissioned a metal worker to create the hardware to their specifications. 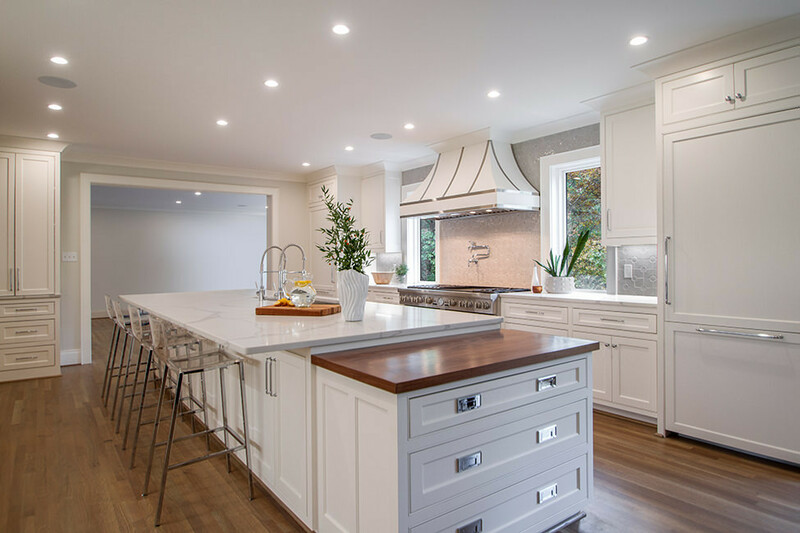 The firm was hired onto the project during the framing phase to help completely transform the existing home from traditional to contemporary. Fortunately, they were brought on board in time to put their stamp on the floor plan and create a kitchen that culinary dreams are made of. 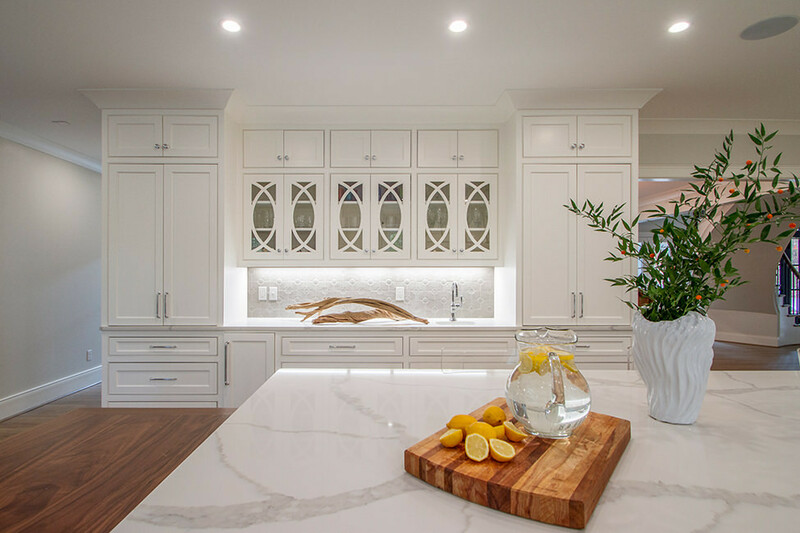 For the kitchen concept, they started with a color palette of white on white to give the space the feeling of being clean, simple and functional. 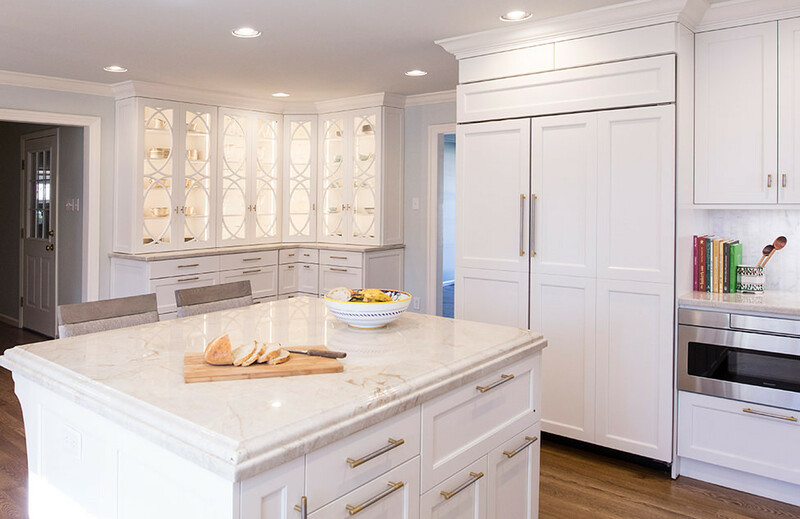 A few of the hidden features include cabinets with felt-lined wine bottle storage, a cutting board installed directly over the wastebasket and panel-ready appliances that conceal ice, refrigeration and freezer for a consistent aesthetic and to allow the 60" range and galley sink to remain the focal points of the room. This three-bedroom, two-and-a-half-bath residence needed an additional play and media room for a growing family. With no rooms to convert, an addition was designed at the rear of the house. 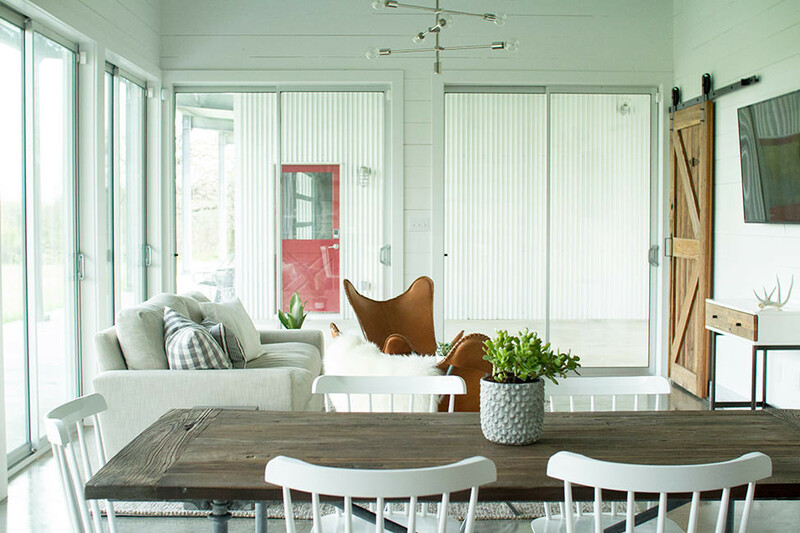 The homeowners' aesthetic is decidedly modern with a warm, chic styling. 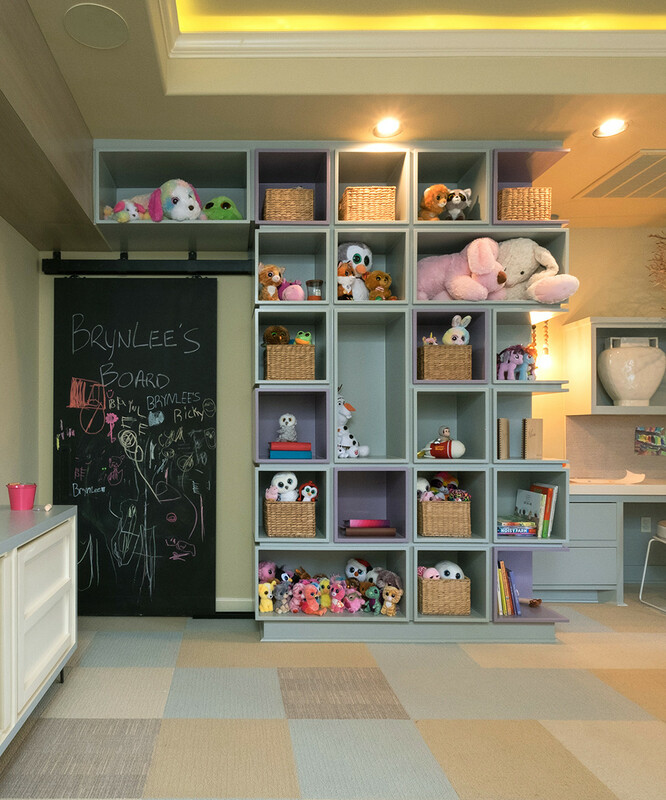 They wanted the room to be about their daughters, feel designed and not just "furnished," yet also be comfortable for the owners and their guests. 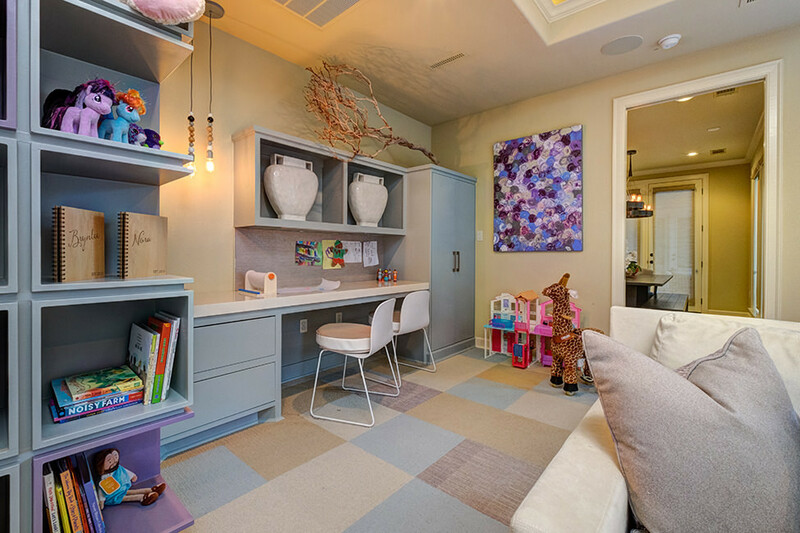 The final design integrated multiple play and work areas zoned with custom millwork while layers of texture and patterns in cream, soft gray and lavender were integrated into the design with custom cubbies, modular carpet, pillows and art. To accommodate guests, in addition to a large sleeper sectional, a millwork cabinet was designed to surround the TVs. The vertical portion of the custom cabinet was designed as a wardrobe with a pull-out clothes bar and adjustable shelves for guests' belongings. The design of the wardrobe was intended to blend seamlessly into the inverted "L" shape with reveals and pulls worked into the door in order to conceal the nature of the storage. 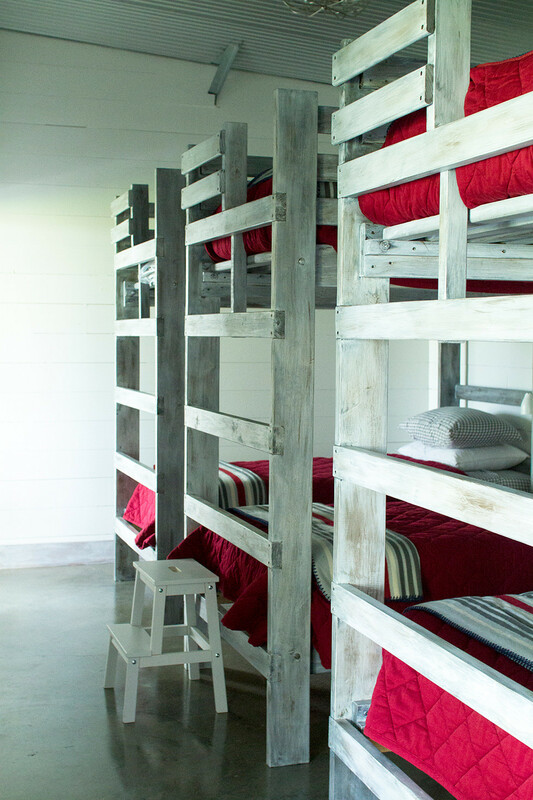 The client's desire for this project was to create a novel vacation home, a place for family and friends to gather away from the city for a relaxing weekend, as well as recreational activities on the ranch such as hunting, fishing and hiking. They purchased land not far from where they love attending their alma mater's football games. 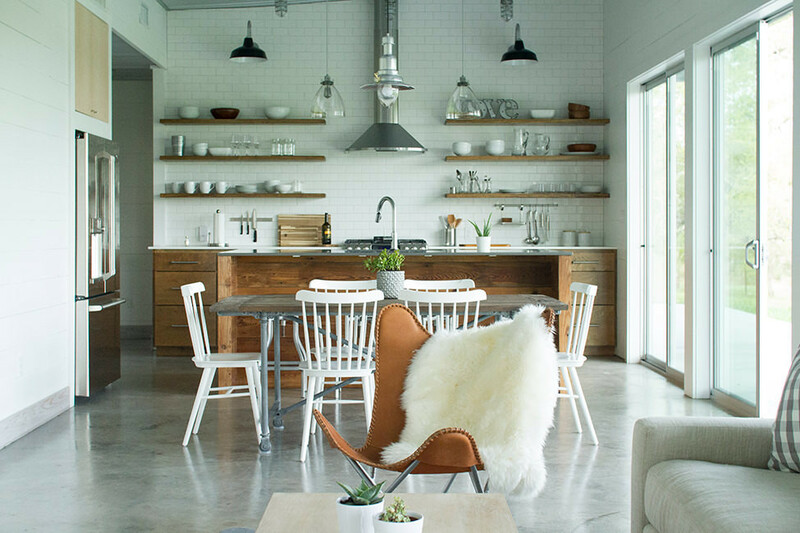 Being in a rural farmland setting, they wanted the ranch house to have rustic and industrial farmhouse elements while still keeping an overall minimal, light and airy modern style to communicate the peacefulness and simplicity they wanted to experience when escaping to this tranquil country retreat. 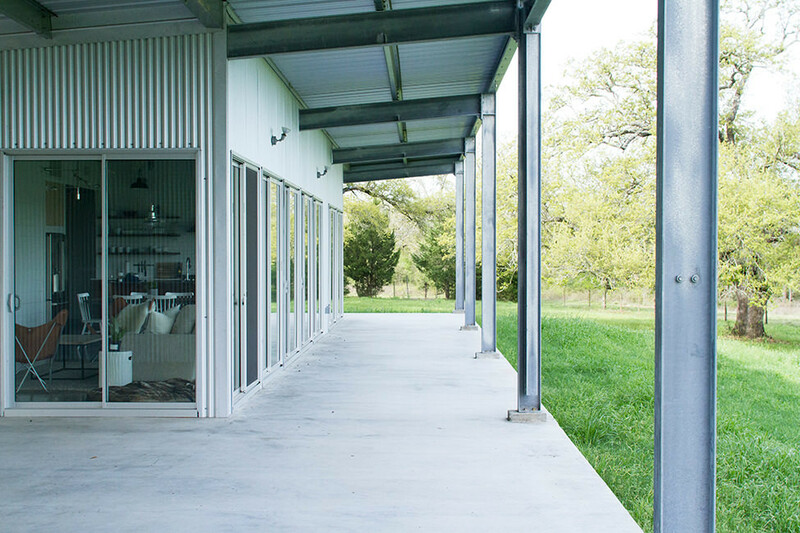 The architect's concept of a wall of glass doors not only added a modern look, but also made the outdoors center stage, all while using natural materials such as concrete, wood, wool and cotton throughout echoed the outdoors subtly brought it in. 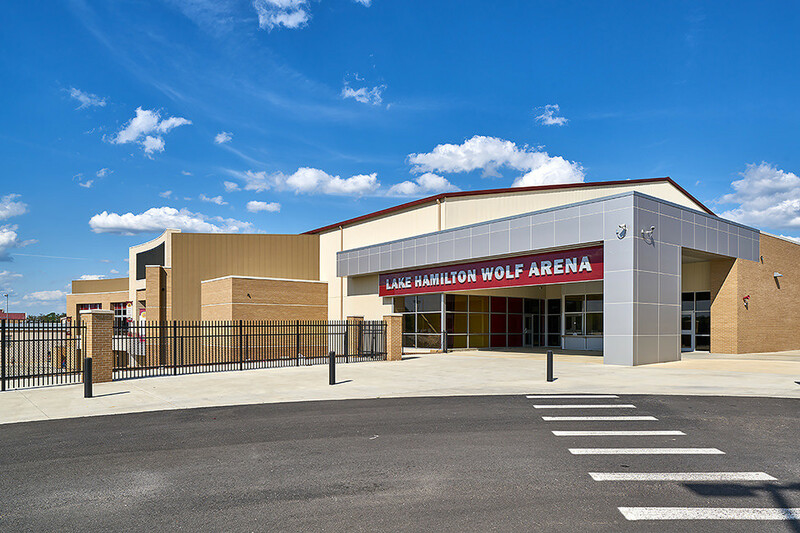 The goal was to create a unique graphic that could incorporate the heritage and history of Lake Hamilton High School's athletic programs using a multitude of sports images and highlighting championship teams throughout the years. Creating the collage from the mountain of yearbooks scanned (from 1945 to present day) was a tedious job, including finding the right sports images, correcting any aspect of the original image and laying out the images to be easily viewed once the overall graphic was printed on vinyl and installed. The design concept was developed as a nod to the wooded site and the use of natural stone and wood on the existing campus. A fall color palette was combined with natural materials of wood and stone complemented by artwork and furniture with a twig motif. Reds, oranges, golds, bronze and walnut wood tones contrast with smooth, white walls in each space. The sanctuary aspect of the concept represents the comfort felt by the residents when they are in the space with their loved ones. 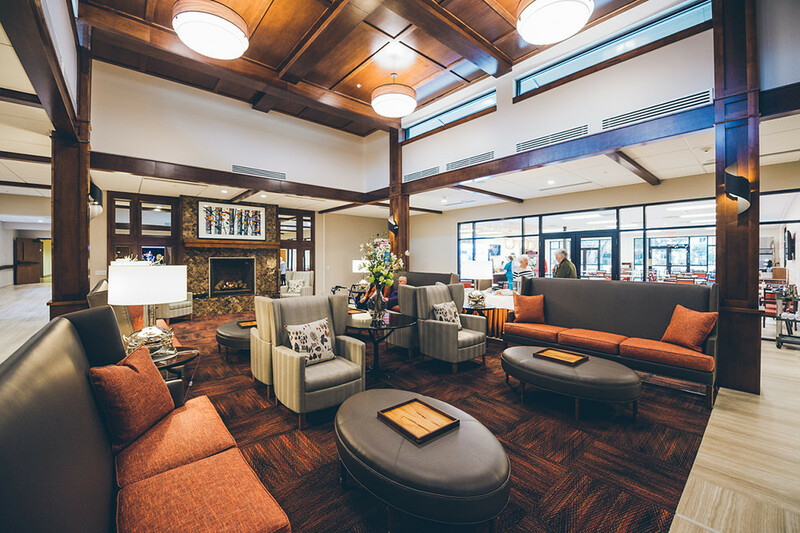 This new expansion was designed to be the hub of activity and events in this senior living facility. 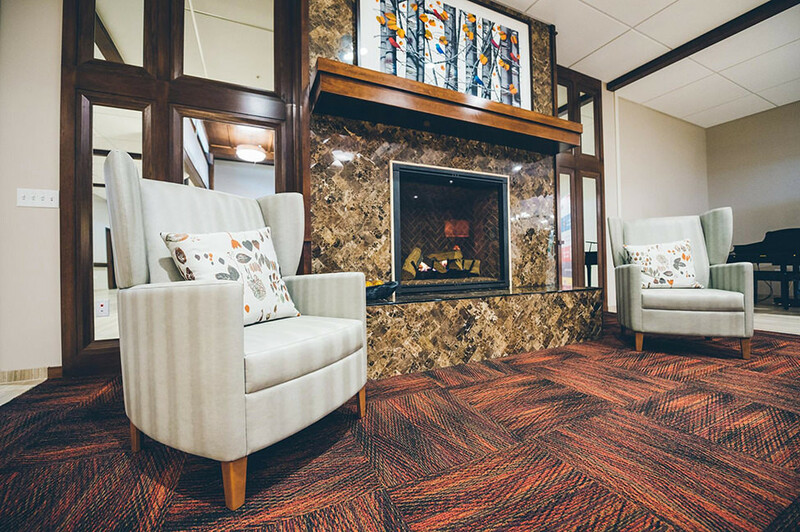 The client desired accessibility, a welcoming atmosphere and an impressive gathering space for residents to use for a variety of purposes. The client also wanted a high-end, classy look that would stand the test of time while complementing the adjacent existing buildings. 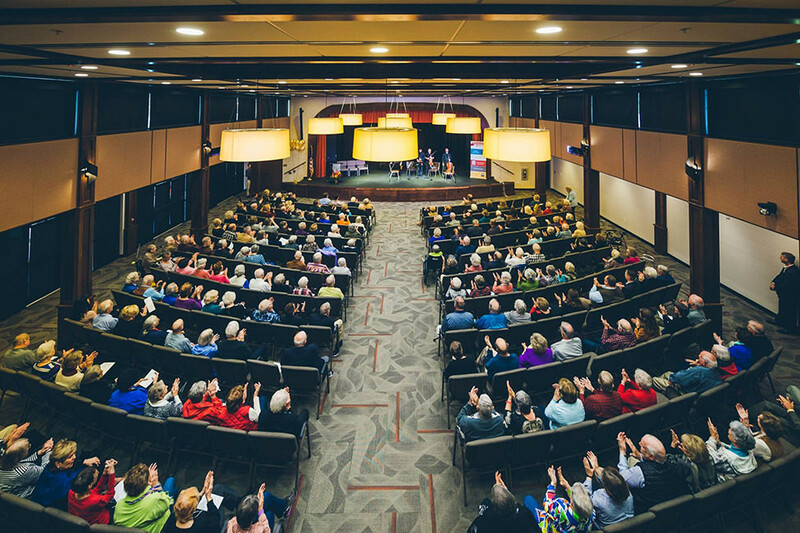 The upscale venue was designed to attract top-tier programming and entertainment in the performance hall. 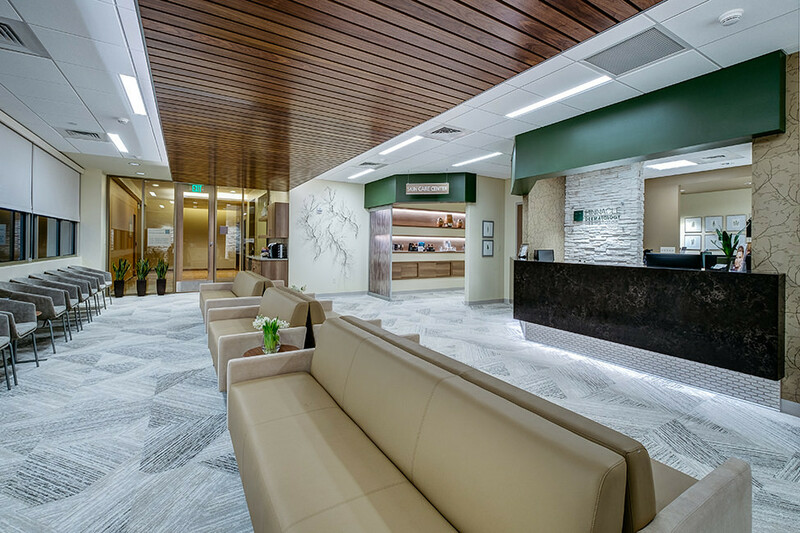 The client desired a warm, natural environment somewhat distanced from the popular white and super-modern aesthetic for this dermatology clinic. The physicians walk their patients through several phases of medical, surgical and cosmetic services with individualized treatment plans, so the idea of the journey to skin health along with the desire for elements of nature were combined to develop a concept based on a path. 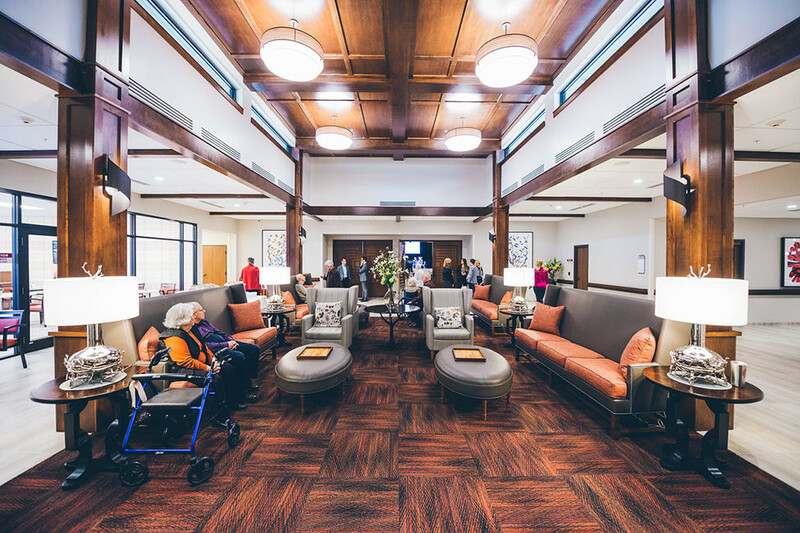 The concept was executed with changes in ceiling heights and materials, patterns in flooring materials at wayfinding points and a clear and organized space plan among calming, approachable and warm materials. 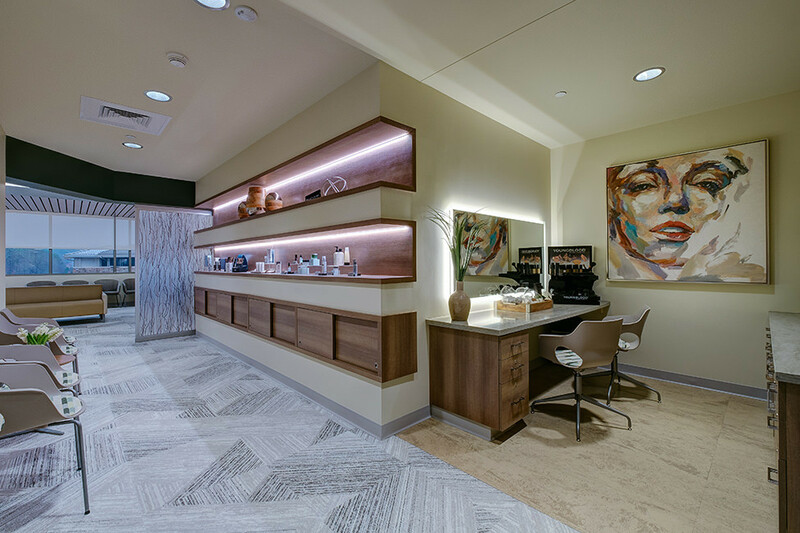 • A space plan that seamlessly integrated a substantial cosmetology presence and allowed for a retail skin care area. 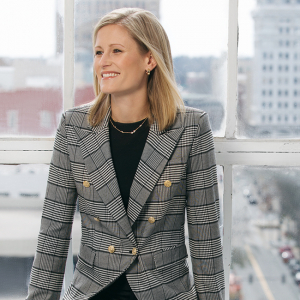 • Well-organized space plan that could allow for expansion into adjacent, empty, unleased tenant space. 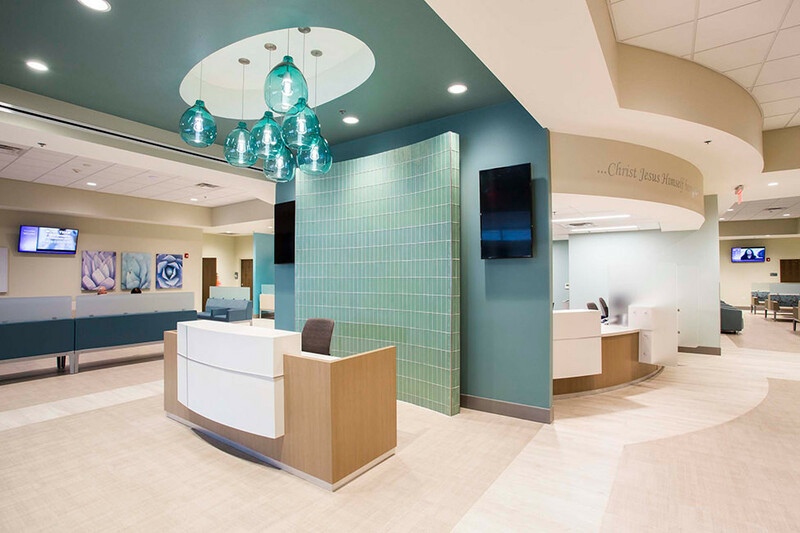 The main goal of this new women's clinic was to provide a spa-like atmosphere that represented the two sides of the growing practice: one for mostly obstetrics and the other for gynecology. The design team brought in biophilic references to ease tensions and nerves while waiting. The colors are beach-like and soothing. 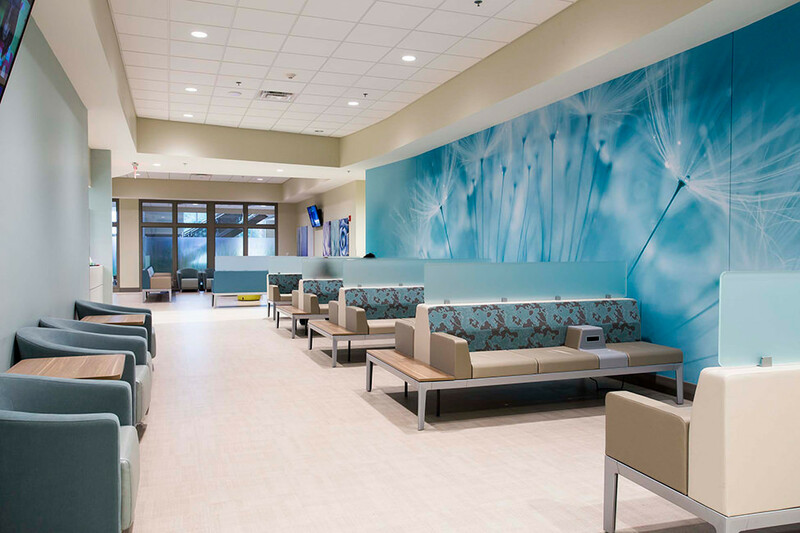 Bold wall graphics provide a focal point to each waiting area as well as a point of conversation. 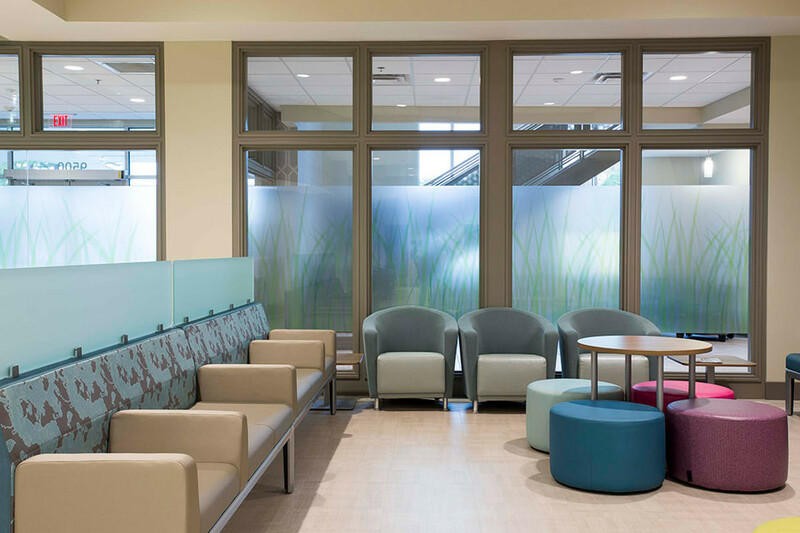 The physicians wanted the space to "wrap around you like a cocoon," hence the implementing of curvilinear elements into the overall design. The clinic occupies the entire first floor of a larger medical office building, which the physicians own. 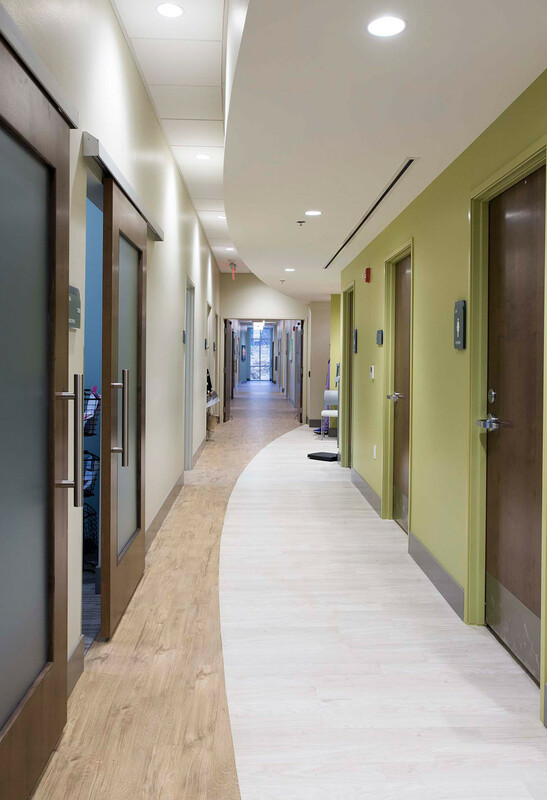 Great care was taken to maintain a beautiful environment from the front door all the way through the building while setting apart the clinic space with separate finishes and identities. 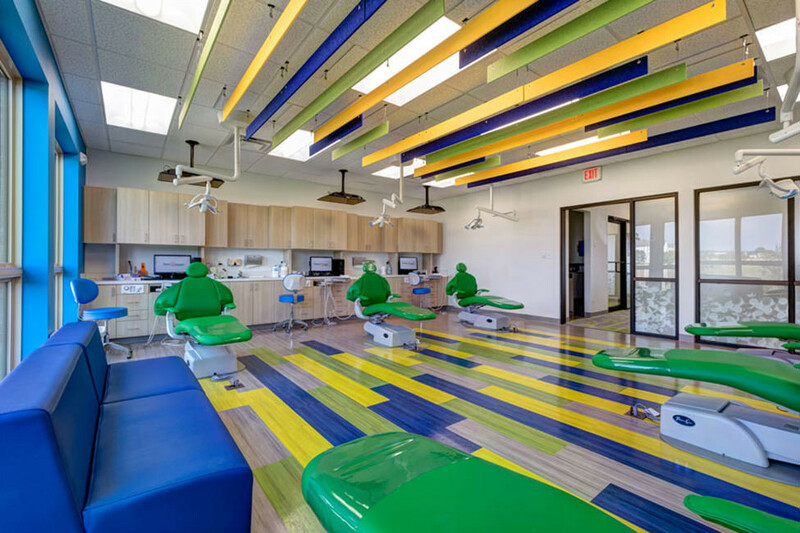 The design for this children's dental clinic was inspired by the elementary triangular lines of a tooth using colors from the company's refreshed branding. 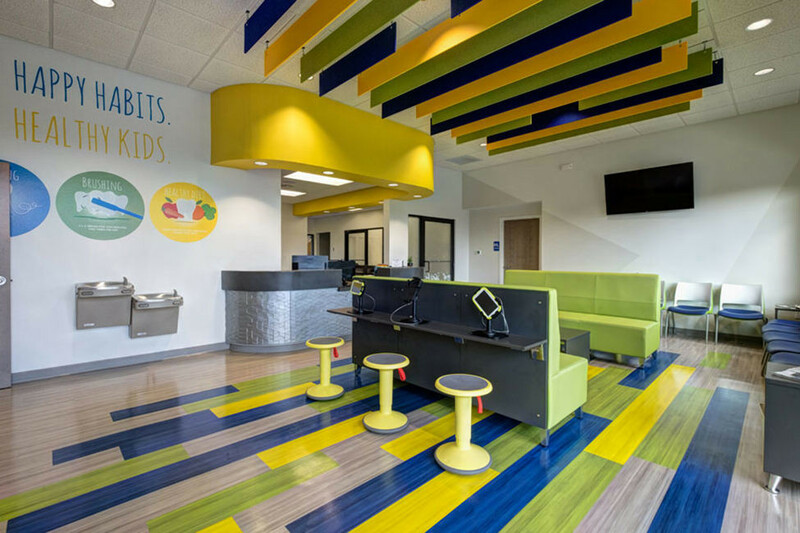 Throughout the clinic, triangles, diagonal lines and solid tertiary colors were used to create a space that is colorful, fun and energetic without catering to a specific age. 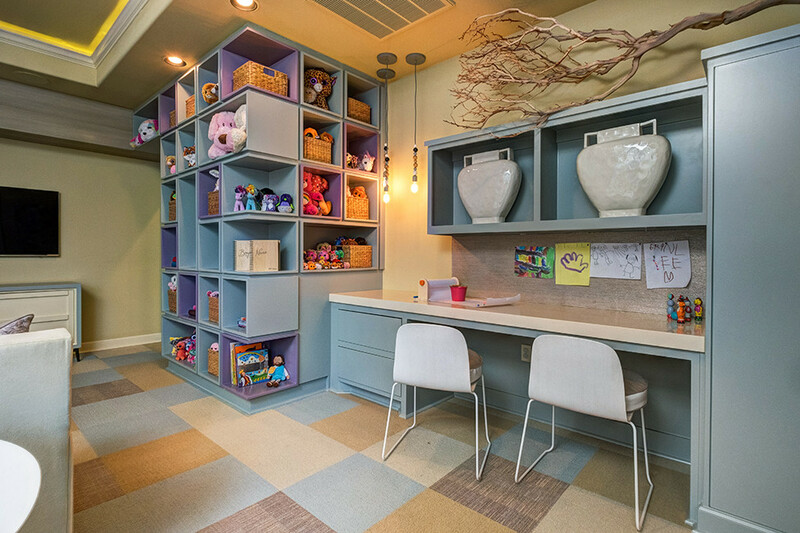 Each space has the opportunity for the pediatric patients to learn about making healthy habits and choices as well as bright splashes of color to engage and guide them through the clinic. Noise control was a concern in the main exam room, waiting room and the corridors. At the interior storefront locations, privacy was paramount and distraction needed to be eliminated. The materials that were previously selected by the architect determined the budget, so all new materials selected had to fall into the same parameters to keep the project on track. The newly renovated cafe creates an energetic and fresh new personality for the room, which was once broken up by walls and different ceiling heights. By demolishing the walls and ceiling, the space plan opens up and better utilizes the room. 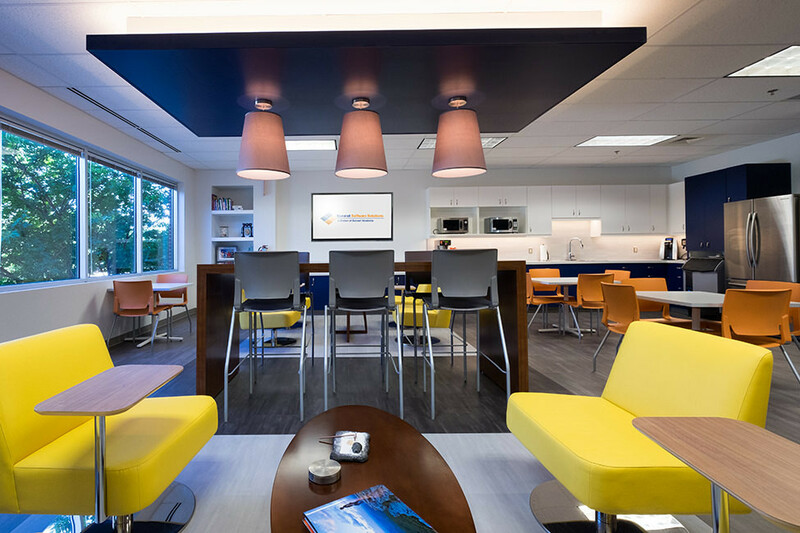 The vibrant color palette enhances the materials' finishes as well as the space plan. 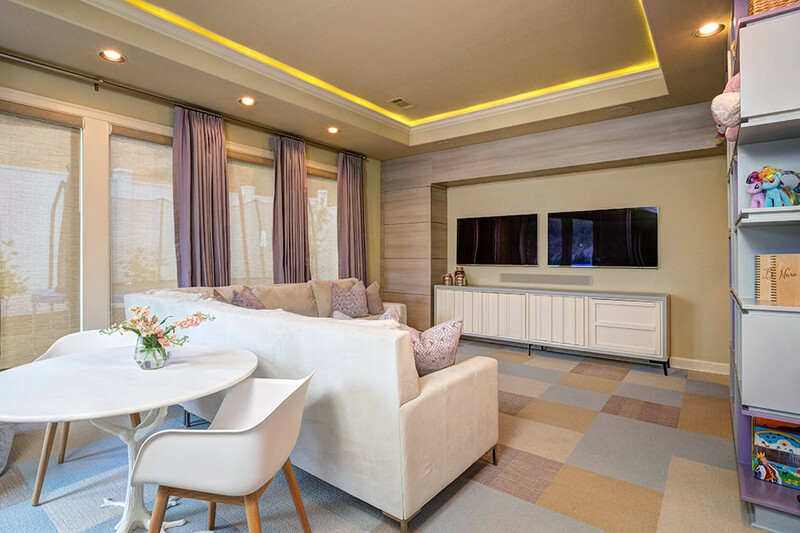 Color and pattern through the use of flooring materials, furniture and ceiling define smaller areas and functions in the room. The cove light draws the eye to the higher furnishings and the pendant fixtures while also balancing out the composition of the furniture and individual spaces. 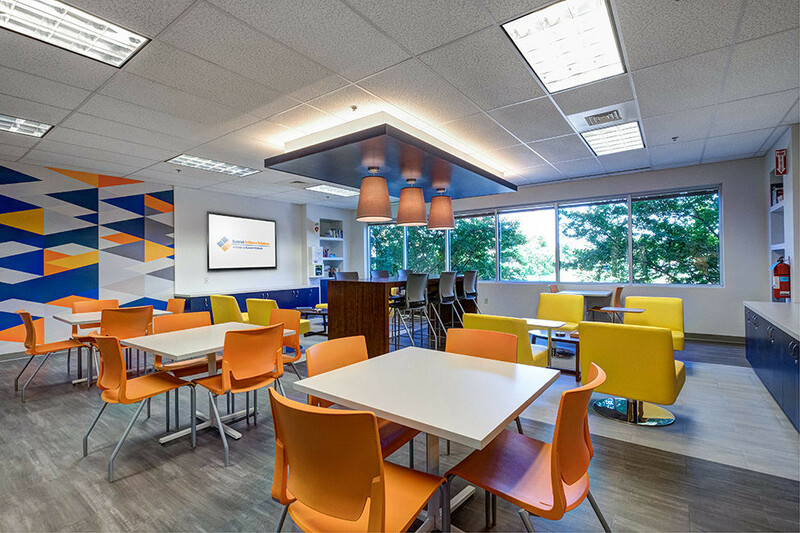 • Maximize the space to seat more employees for office events. • Modernize the interior finishes and make better use of the room. 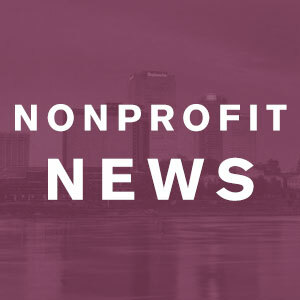 Alissa A. Oates - Restructure Design Inc.
Lisa Claybrook - Lisa Claybrook Interiors Inc.